Jeep drivers are known for their passion and pride. Driving a Jeep is about more than a vehicle - it's about a way of life, whether it involves hiking or camping trips, or more aggressive Rubicon-style driving courses. This shirt is perfect for those drivers who love the adventure and thrill their Jeeps offer, and have no problem sharing that feeling with the world - we made it especially for them, in fact. The Jeep Every Damn Day T-shirt is stitched from a 5.3-ounce pre-shrunk 65/35 cotton-poly blend for extremely soft comfort. It is fully double-needle stitched for a classic fit and long life. 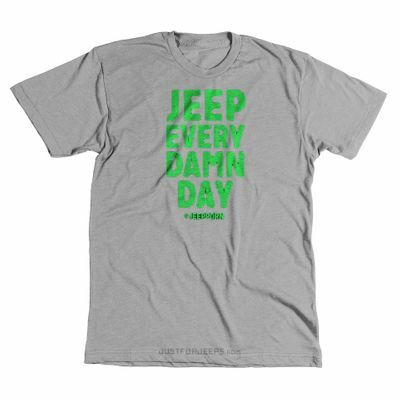 It features the bold statement "Jeep Every Damn Day" in bright green on gray material. Its sentiment is perfect for drivers hanging out at a Jeep event, on an outdoor adventure or around people shopping for a Hummer. This is a perfect gift for the Jeep driver in your life with plenty of attitude and adventure.